Here is another counting game that makes the use of generics along with some class inheritance built in. Like I said before I’m starting to like working with collections more and more because of the simplicity of dealing with them. It makes for some cleaner code. I also wanted to work in the class inheritance. Granted, yes, this is on a simple scale. However, I think it demonstrates the power of what inheritance can do. My idea for this program was a visualization of adding items to fish tank. Don’t laugh at the graphics aspect of this program. It was all in my head and I wanted to base the interface off my last post. Also note that I’m only going to include code for one of the rock objects. The other are pretty much the same so if you want to see them download the source and take a look. //Lambda expression for exiting the program. //Lambda expression for the reset button. //Lambda expression for the igneous rock button. //Lambda expression for the sedimentary rock button. //Lamda expression for the metamorphic rock button. //Lambda expression for the add sand button. //Lambda expression for the add dirt button. //Lambda expression for the rock picture box display. _rockGame.Update(ea.Graphics, rockPictureBox.ClientSize);       //This updates the picturebox to show the rock. rocksAmountValueLabel.Text = _rockGame.TotalRocks.ToString();   //Updating the total amount of works. igneousRockValueLabel.Text = _rockGame.CountIgneousRocks.ToString();   //Updating the igneous rock counter. 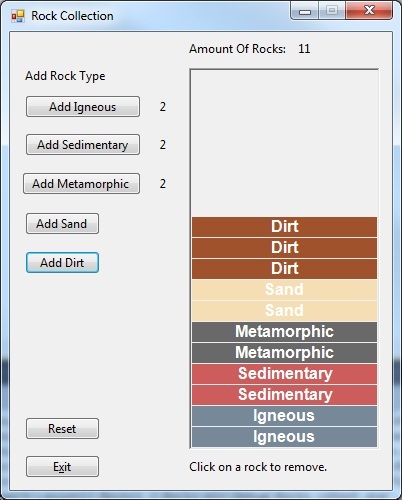 sedimentaryRockValueLabel.Text = _rockGame.CountSedimentaryRocks.ToString();    //Updating the sedimentary rock counter. metamorphicRockValueLabel.Text = _rockGame.CountMetamorphicRocks.ToString();    //Updating the metamorphic rock counter. //PictureBox MouseUp lambda expression used to remove the user selected rocks. _myRockObjects.Add(rocks);      //Adding the rock to the general collection list. _myIgneousRock.Add(rocks as IgneousRock);       //Calling the method to add the rock. //Using a foreach loop to which rock is selected. _myIgneousRock.Remove(rocks as IgneousRock);    //Calling the method to remove the rock. _myRockObjects.Remove(rocks);   //Removing the rock from the general collection list. //Method used to reset the collections. //Using a for loop to allow updating. 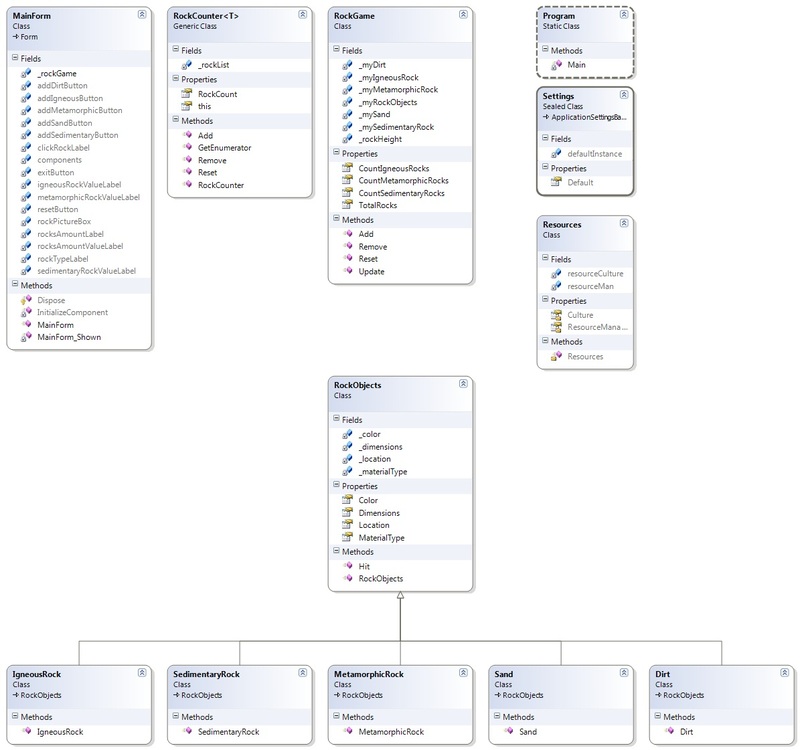 //Creating a rock object each time the loop runs to pull data from. //Set the added rock's location. //Drawing the text label for each rock. //Aliging the text to be in the middle of the rock graphic. //Method used to add rocks to a collection. //Method used to remove rocks from a collection. //Method used to clear the collection.